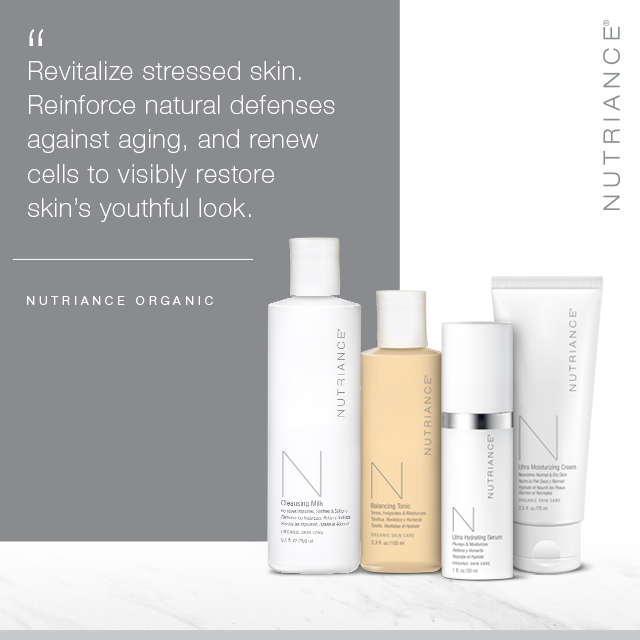 FREMONT, Calif., April 4, 2018	(Newswire.com) - NeoLife International, a name synonymous with superior quality nutrition for 60 years, has just announced a new product line: Nutriance Organic Skin Care. 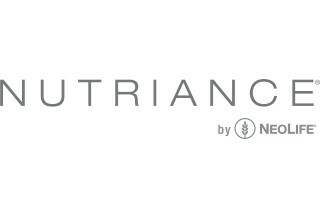 Nutriance Organic represents a step into a new era of skin care for NeoLife and is the first-ever marine-based organic skin care line in the direct selling industry. With this new line, the company is positioning themselves to take the skin care market segment by storm, offering a solution to a difficult problem facing consumers today. “The average consumer has to wade through all the cheaply made, overly priced products out there. So many people don’t even realize what harsh ingredients and chemicals they’re lathering themselves in that can have negative effects over time, putting ourselves at risk. It’s scary. We need to end this trend. And that’s what we plan to do,” says NeoLife CEO Kendra Brassfield. The new facial care range was designed according to latest advances in skin care science and today’s understanding of the needs of our skin’s protective barrier. “We’ve designed Nutriance Organic to revitalize stressed skin, reinforce natural defenses against aging and renew cells to visibly restore skin’s youthful look,” comments Dr. Diane Clayton, NeoLife vice president of product strategy, research & innovation. Nutriance Organic uses marine botanicals sourced from a protected biosphere off the coast of Brittany, France - an area renowned for its exceptional wealth of seaweeds, purity of seawater and thalassotherapy centers. “Marine ingredients and seawater have been used for centuries in skin care and for their general benefits to overall health and well-being, and so marine botanicals were a natural choice for our new skin care line,” adds Dr. Diane Clayton. The term for the therapeutic use of seawater and marine ingredients such as seaweed extracts and marine minerals is known as “thalassotherapy” (that comes from the Greek words “Thalassa” meaning "sea" and “therapeia” meaning "healing"). Seawater and marine ingredients were used for their rich mineral and trace element content which was believed to enter the skin and clear the pores, detoxifying and balancing the body. 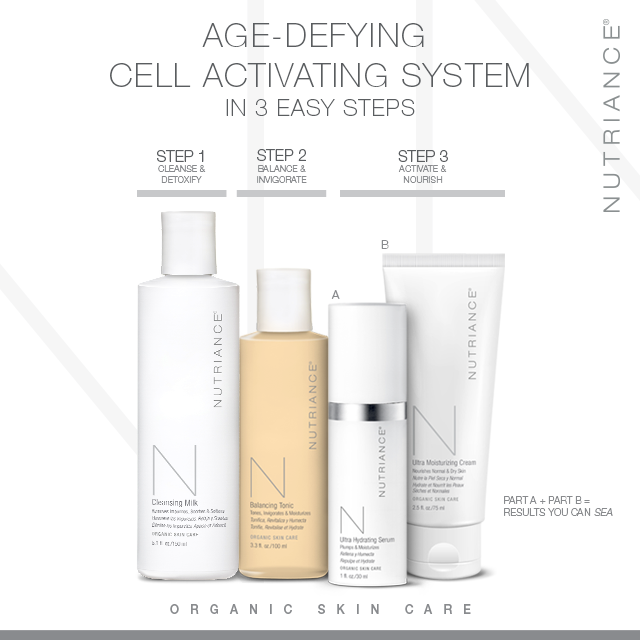 The Age-Defying Cell Activating System harnesses the synergistic properties of Nutriance Organic in three simple steps designed to fight the causes of aging and skin damage and with specific formulas to match two main skin types: either Normal to Dry or Combination to Oily. Nutriance Organic is formulated in collaboration with leading skin care experts and marine biologists and clinically tested at prestigious European research and dermatology centers. 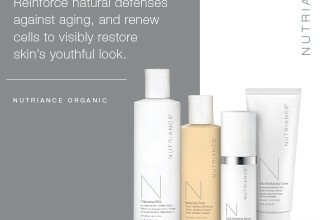 Nutriance Organic is NOT animal tested, non-comedogenic, 100 percent vegan and paraben-free. Fresh Marine Seaweed Extracts - Using hand harvesting and gentle extraction techniques for quality and environmental sustainability. Extracted within 24 hours of harvest for potency. Pure & Patented Seawater - Biocompatible for perfect harmony with the epidermis. With more than 80 trace minerals. Essential Oils - Including Lime, Sweet Almond, English Lavender, Cranberry and Chamomile. Botanical Waters & Botanical Extracts - Including Cornflower, Witch Hazel, Ginseng and Ginkgo biloba. Protective Antioxidants - Including carotenoids and polyphenols. Nutriance Organic is the result of a decade-long search. We searched the world over and have now found the MOST unique source for biocompatibility and perfect harmony with the skin with our pure seawater and marine botanicals which are complemented by other valuable botanical ingredients. The new line stays true to the company’s "based in nature, backed by science" product philosophy and is stamped with the Scientific Advisory Board seal of approval that represents a worldwide network of nutrition experts, doctors, scientists and research facilities that are dedicated to delivering optimum health based on nature’s blueprint. NeoLife has been providing families with both high-quality nutritional supplements and fine-quality skin care products for decades, giving added peace of mind with a trusted name. For those who want to be a customer, NeoLife offers a Club Member program. Joining is free, simple and gives valued customers the ability to shop at a special 15-30 percent discount, as well as access to nutritional education, free product when with friend referrals, weight loss and fitness challenges, and fun events around the country. And for any entrepreneurs out there who have a passion for sharing good health … NeoLife is also redefining the world of startups. Put simply, it’s like a tech startup but with nutrition. There are low barriers to entry because NeoLife provides the infrastructure that any successful business needs, as well as consumable products and a compensation plan. So instead of having to raise hundreds of thousands of dollars to get started, it makes entrepreneurship accessible to everyone. When an entrepreneur become a Promoter, they own their own NeoLife business and it can be passed down as an income-generating asset to future generations. 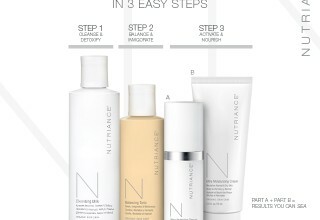 NeoLife Promoters also have access to a turnkey business system to help launch Nutriance Organic through Spa Hour events. Promoters across the country are hosting Spa Hours and sharing the best-kept age-defying secrets of skin care with their friends and family. The goal is to empower people with knowledge to keep themselves and their loved ones safe, healthy and glowing. It’s also a lot of fun for guests, with the opportunity to pamper themselves with a Self-Spa Treatment using the age-defying Nutriance Organic skin care line. 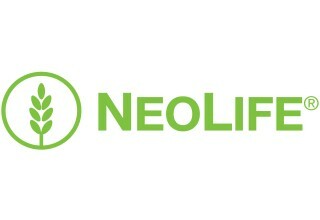 To learn more, visit www.neolife.com. We are a global health and wellness company committed to helping people take control of their health.